This is the online manual for the Aerodrums air drumming instrument. In the event that you can’t find what you are looking for here, you can ask a question on the forums at aerodrums.com, or send an email to the support address. You can open this manual in your browser from Aerodrums by clicking the “Help” button in the home screen, then by pressing the “Online manual” button. Please note that this manual applies to the latest version of Aerodrums. Mac users can get the latest version here. Windows PC users can check that they are running the latest version by clicking the “Check for Aerodrums updates” link that is located in the Aerodrums group in the Start Menu, or by running the updater.exe program that can be found in the directory where Aerodrums was installed (typically C:\Program Files (x86)\Aerodrums). Please make sure that Aerodrums is not running when checking for updates. This section of the manual covers the few steps required to start drumming with Aerodrums for the first time. If you have followed the instructions from the manual that came in the box, you can skip to the first run section. 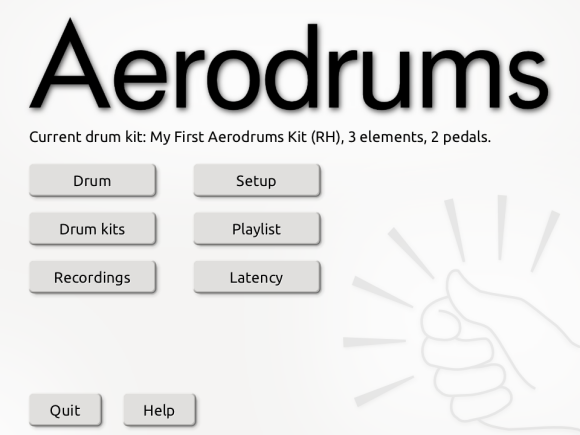 Download the Aerodrums installer from this address: aerodrums.com/installer/. You will need to enter your product key to access the installer and any software updates so keep it safe. Make sure you are logged in with a user account that has Administrator privileges and that you have not plugged the camera in yet. Download the installer zip file, extract it, then run the setup application. Windows will ask you if you want to allow the setup application to make modifications to your computer, please click ‘Yes’ or ‘Allow’ (see images below). This is required because setup also installs a driver used by Aerodrums to communicate with the camera. If you encounter problems installing the camera driver, please refer to the troubleshooting section of the manual. The setup application will then install the Aerodrums program. Please follow the instructions given. You will need to enter your product key again during installation. Open the downloaded disk image (.dmg) file and follow the displayed instructions. You will need to enter your product key the first time Aerodrums is run. During this process, you may notice that the housing of the camera lens can rotate. Once you have attached the lamp to the camera, please ensure that the lamp/lens is fully rotated clockwise when facing towards you (blue dot setting). You can now plug the lamp into a USB port. Please do not plug the camera in yet. Instead, please wait for the installer to prompt you to do so. There is enough free space in front of the table (or any surface of similar height, for example a low shelf). You have the ability to control the amount of light near your seat. Aerodrums works by watching you drum through the camera. It understands the location of your drum sticks and feet because they appear brighter than other objects, thanks to the lamp and markers. For this reason, it is important that the camera cannot see objects that are brighter than the markers. The picture below shows examples of unsuitable objects near your seat. Please note that Aerodrums is not designed to work outdoors in broad daylight. The video below illustrates how to place your drumming seat so that the camera has a good view of you. You can also read on and look at the drawings that follow. If you are left handed, please imagine that drawings 1 and 2 are mirrored, and substitute “right” for “left” in the explanations that follow. 1. 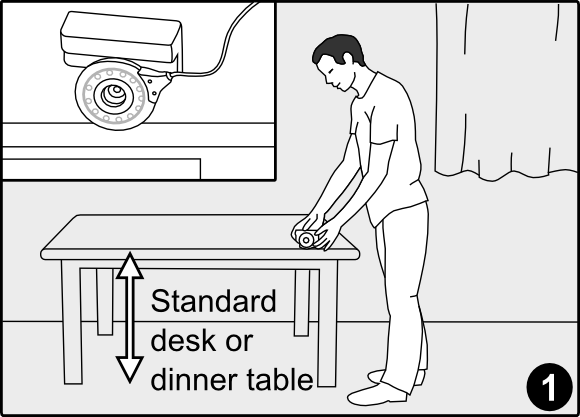 Place the camera on the very edge of a standard height desk or dinner table (roughly 72cm or 29 inches), so that the lamp overhangs the table. 2. 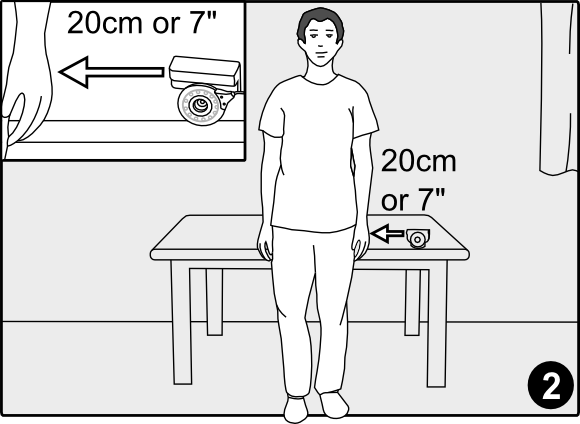 Stand against the edge of the table, facing away from it, with your arms at your sides so that the camera is roughly 20cm (7 inches) to the left of your left hand. 3. 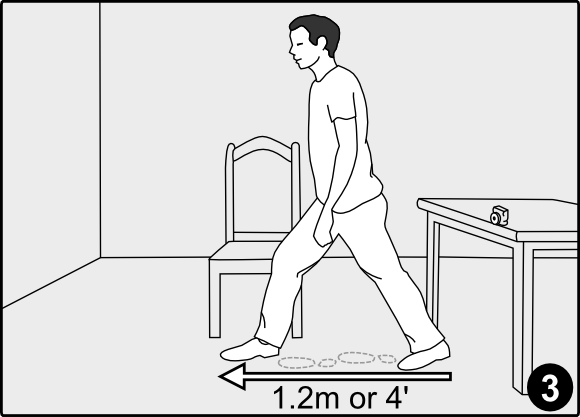 Take one big step forward, roughly 1.2m (4 feet) from heel to foot tip. You can also take three small steps, placing your feet at the end of each other. 4. 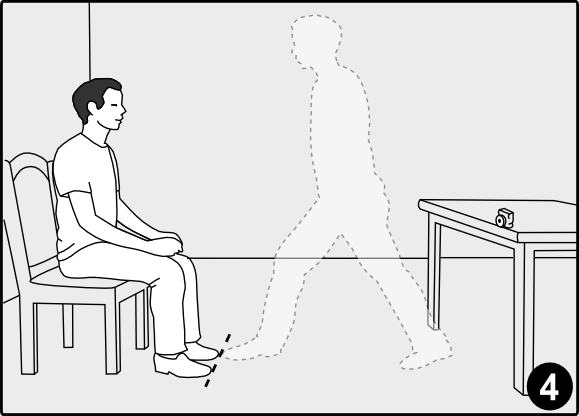 Place your seat directly in front of you, facing the table, so that when you are sitting, the tips of your feet are where the tip of your front foot was after the big step. At this point, please turn the lamp on using the small black switch located where the cable meets the lamp. 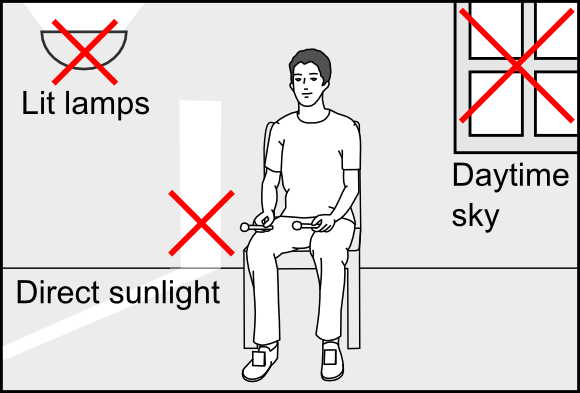 As regards the lamp, please refer to the safety warning leaflet: we advise that you wear sunglasses when drumming with Aerodrums. Please place your computer screen away from the camera. If you don’t, the lamp will dazzle you when you look at the screen because it will be in your direct line of sight. Aerodrums is designed to let you operate drum pedals by tapping the ball of your foot (using either heel-up or heel-down technique). To wear a foot marker, orient it so that the base of the foam wedge is facing down, and the reflective patch faces away from you and towards the camera. Insert your foot into the elastic loop. 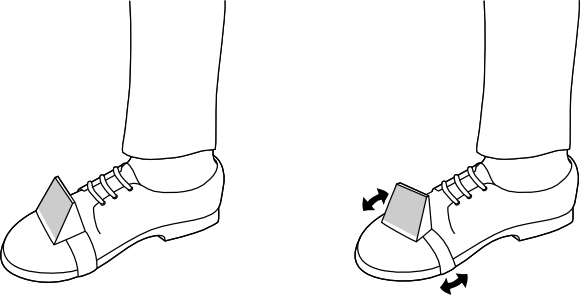 We recommend that you place the marker as far to the front of your foot as possible, while making sure it is secure enough to not slip off (see drawing below). If your feet make a wide angle when you play, pivoting the foot markers so that they face towards the camera will help Aerodrums track your feet better. When you run Aerodrums for the first time, you will see three introduction screens then be asked to pick some settings that pertain to audio latency. Latency is the time that elapses between the instant when you intend to hit a drum and the instant when the resulting sound can be heard. Your input is required because each computer’s audio hardware is different. The Configuring latency section of this manual explains the latency settings in detail. After the first run, they can be reached from the home screen by clicking the “Latency” button. When you click the “Setup” or “Drum” button for the first time, Aerodrums will guide you through the few remaining steps to get drumming. It will ask you if you are left or right handed in order to select the appropriate layout for your first drum kit. You will first see two screens reminding you how to pick a drumming location and how to place your seat with respect to your camera (see above). Aerodrums will then display what the camera sees, with a drawing of a seated drummer overlayed over the picture. The purpose of this step is to let you aim the camera to achieve a good framing of your seat. It works by asking you to pan and tilt the camera until the drummer appears seated on your seat. The drawings below illustrate the process. It is important that the drum sticks, the foot markers, and you stay out of sight of the camera during this step. If you notice that your seat is too big or too small for the drummer, please check that you have placed your seat as shown above. During this process, Aerodrums may display a warning message about brightness and a “Check lighting” button. We recommend that you press it before fine tuning the orientation of the camera. If there is a problem, areas that are too bright will appear in red. Closing some curtains or blinds and dimming some lights should solve this (click the “Check lighting” button again if it is still there). If you cannot eliminate the red areas from the picture, you will have to pick a location where you have more control over the light reaching the camera (see above). The first few times you go through this process, you may find it useful to go to your seat and observe how well your image matches the drawing of the drummer. Of course you may not be the same shape or size as this generic drummer, but if you are able to place your feet where his are, and your image doesn’t feel too big or small compared to him, then your framing is good. Again, if you appear much smaller or bigger than the drawn drummer, you should probably check that you have placed your seat at the right distance from the camera. Remove them from the camera’s field of view. Dim the lights or draw blinds or curtains. If there are bright objects, you can click “Back” to get a better view of where they are located. Please note that the red areas will not update on this screen. This means that you will need to click “Next” again to check that you have succeeded in removing the bright objects. Once there are no bright objects, Aerodrums will invite you to take your seat. Make sure that your computer screen is oriented so you can see it from your seat, and don’t forget your drum sticks; and foot markers if you wish to use pedals. You may notice that there is a “Skip” button on the screen that warns you about bright objects. Please only use this button if you are certain that the objects detected (red areas) correspond to your sticks or your foot markers. This can happen if you have left them in view of the camera during this step (e.g. you left the sticks on your seat). You are now ready to drum. Your first drum kit is a basic kit with snare, hi-hat and bass drum. When you want to select a different kit, go back to the home screen by clicking the home icon, then click the “Drum kits” button. You can then choose a different kit from the list of preset kits in the screen that appears. This screen also lets you create your own drum kits. This feature is documented in the making new drum kits section of this manual. When you are done, click “Ok” to return to the home screen. Aerodrums now displays your drum kit and the location of your drum sticks and foot markers (if you are wearing them). Make air drumming gestures at the location of drums or cymbals to hit them. You can find a tutorial video of the stick technique that works best with Aerodrums here. The colored circles represent your sticks (RH, LH) and feet (RF, LF). Notice the dotted line, your sticks should appear above it and your feet below it. If your feet cross this line while operating pedals, we recommend that you adjust your camera and seat again. In the bottom left of the drumming screen, there are two buttons that you can click with your mouse. The top one toggles full screen display. The bottom one brings you to the home screen. The kit presets that we provide all contain a snare drum placed at the usual snare location: directly in front of the drummer, slightly above their knees. The height of your seat, your height and your posture can cause the snare (and the whole drum kit with it) to be offset with respect to where you expect it to be. In this case, you will need to place the drums so that they can be reached comfortably, just like you will when you create your own custom kits later on. The drum kit adjustment section explains how to place single drums or all the drums at once. 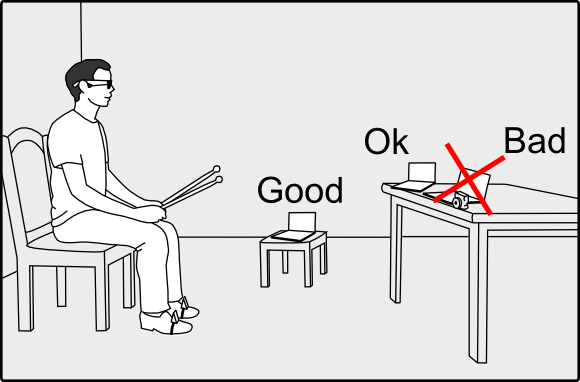 When you are drumming, you can perform useful tasks without reaching for your computer. This is done via a menu that you can navigate by making the same air drumming gestures you use to hit your drums. you have to activate them in the same way you did to enter the drumming menu. Leaving your stick long enough on any button or slider will activate all the buttons and sliders. Screens where you can only interact with the menu items. In those screens, buttons and sliders do not require activation: you can hit or adjust them immediately. 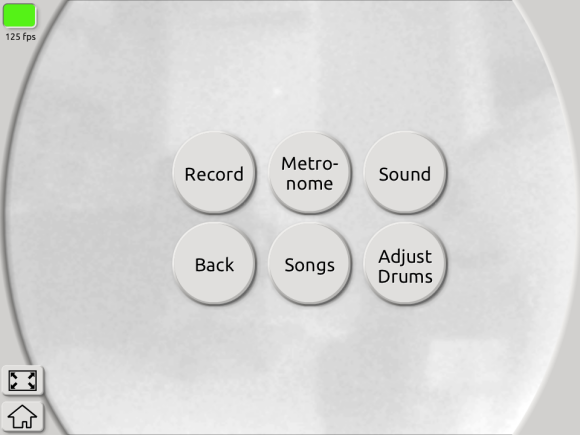 On the “Adjust drums” and “Sound” screens of the drumming menu, you will notice a “Save changes” button. It gets highlighted in yellow once you have made changes in any sub-screens. If you want your changes to persist the next time you run Aerodrums, please make sure you hit that button. Aerodrums keeps track of the last song that you played, if any. To play a song, it must first be in your playlist. You can add mp3 or ogg files to your playlist by clicking the “Playlist” button in the home screen, see picking songs. To pick a song and start/stop playing it, hit the “Songs” button in the drumming menu. You can then cycle through the songs in your playlist with the “Previous Song” and “Next Song” buttons. Use the “Play/Stop” button to toggle playback. If you want to practice a specific part of a song, you can use the “Start time” slider. Each time you hit “Play”, Aerodrums will play the song from that time. Sometimes you will want to get ready to drum before the song starts playing. Hit the “Play with delay” button to do this. It will bring you back to the drumming screen and there will be a 5 second countdown until the song starts playing. Hit the “Metronome” button in the drumming menu to enter the metronome screen. From here you can start or stop the metronome and set the tempo using the “Tempo” slider. You can adjust how drums, songs and the metronome are mixed, as well as the master volume and drums panning/reverb, by hitting the “Sound” button. To change volume levels, hit the “Volume mixing” button to enter the volumes screen. By hitting the volume button to the right of the “Done” button you can cycle between master, drums, song and metronome volumes. The slider to the right of that will adjust the currently selected volume level. As you make modifications you can keep drumming to save you from having to exit this screen. To change the amount of reverb applied to the drums, hit the “Reverb” button to access a reverb slider. By hitting the panning button you can alternate between “Center panning” and “Auto panning” modes. Center panning means that the drum samples will be played without any additional panning applied (the samples that are included with Aerodrums are generally panned down the center). Automatic panning means the drums will be panned based on their position relative to where the drummer is seated, e.g. for a standard right-handed kit, the snare drum would be panned down the center, the hi-hat would be panned slightly to the left, the ride cymbal would be panned to the right, etc. Aerodrums lets you record your drumming for later use, such as exporting it as a wav file (see Exporting your music). Hit the “Record” button in the drumming menu to start recording. While recording, the edges of the screen will flash red. Hit the “Stop” button to finish recording. Each recorded performance will appear in the Recordings menu, reachable from the home screen by clicking the “Recordings” button. While drumming, you can make changes to your drum kit, such as moving a drum or adjusting how it responds to hits. To do so, hit the “Adjust drums” button in the drumming menu. Please note that you can only do this if the drum kit you are currently playing is not one of the preset kits. If you are using a preset kit, the “Adjust drums” button will be grayed out. To be able to adjust the drum kit, you will need to go back to the home screen, click the “Drum kits” button, create a copy of the current preset by clicking the “Clone” button, then click “Ok” to leave it identical. When you resume drumming with this new drum kit, the “Adjust drums” button will be available. The next section documents all the adjustments you can make. Use this mode when you are satisfied with the overall configuration of your drum kit, but you want to move one drum or cymbal. Aerodrums will first ask you to hit the drum or pedal you want to move, then to make an air drumming gesture at its new location. 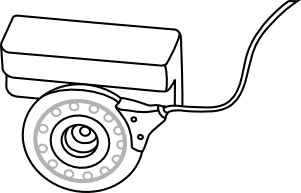 The current drum/pedal being moved is indicated with a yellow halo. Aerodrums sometimes misunderstands which drum you intend to hit and you want to fix this. You want to experiment with a completely different arrangement of your drums and cymbals. The first case can happen when you involuntarily place your seat closer to or further from the camera than is expected by the drum kit’s current configuration. It may particularly affect drums that are near each other on the screen, but behind each other in reality, like for example a high tom and a snare. To remedy this, when Aerodrums asks you to place a drum, take care to hit it at the depth (distance from the camera) you intend for it. For example, closer for the snare and further for the high tom. You do not have to change the screen location of any drums, Aerodrums is able to distinguish between near and far drums once reminded of their correct depth. Again, it may need reminding only if your seat or camera placement has changed. For this case, we recommend not skipping any drums. Because Aerodrums can distinguish between near and far drums, it is not a problem if drum icons overlap significantly on the screen. In the second case, you will probably want to adjust the response of the drums you have moved far from their original location. Sensitivity: how hard you need to hit the drum in order to hear the loudest sample. Volume: how loud that drum will sound compared to the other drums. Response curve: the shape of the curve that maps your drum stick or foot speed to the loudness of the sample played. In this mode, you can adjust the volume and sensitivity of individual drums and pedals at the same time as you drum. To set the current drum or pedal being adjusted, hit it firmly twice in a row. A yellow halo indicates the current drum or pedal. Hi-hats have a different response for stick and pedal hits; take care to hit the hi-hat twice with a stick to adjust stick response, or with your foot to adjust pedal response. Aerodrums displays a gauge and graph on the side of the screen. Each time you hit that drum, the speed you hit it with will be displayed on that gauge. This lets you visualize where that hit fell within the sensitivity interval. For example, if it was near the maximum but you feel that you didn’t hit very hard, you may want to decrease the drum’s sensitivity. Use the “Sensitivy” slider for this. Use the “Volume” slider to adjust how loud the current drum sounds compared to the other drums. 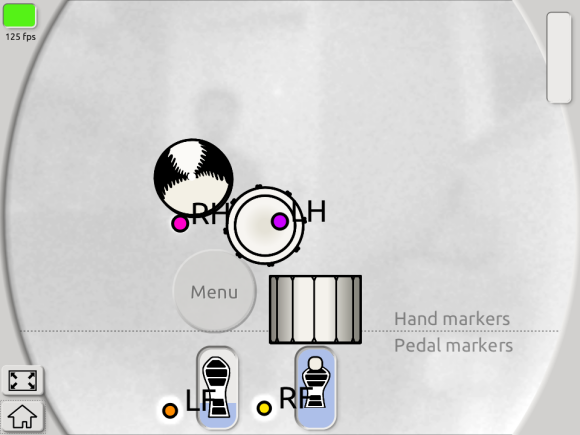 To cycle between the choice of response curves for the current drum, hit the button to the right of the “Done” button. The displayed response curve graph will update as you do this. Hi-hat range and splash. On this screen, you can adjust how much your foot must travel to open a hi-hat fully. You can also adjust how sensitive Aerodrums is to the foot motion that indicates hi-hat splashing. This foot motion consists in sharply bringing your foot back up before it reaches the floor, as if you were throwing the pedal board downwards to make it bounce. If your kit contains several hi-hat cymbals, you can select the one whose range and splash sensitivity you want to adjust by hitting it twice to highlight it. Hi-hat drop clutch. This screen lets you adjust how open a hi-hat is when the foot that actions it is on a different pedal. If your kit contains several hi-hat cymbals, you can select the one whose drop clutch you want to adjust by hitting it twice to highlight it. Cymbal choking (experimental). Aerodrums lets you choke all your kit’s cymbals (except the hi-hats) by bringing the tip of your sticks inside either of two zones. By default, these zones are located outside of your reach. On this screen, you can use the sliders to bring either zone closer to your kit, so that you can adjust them for comfortable reach if you wish to use this feature. Click the “Playlist” button in the home screen to edit your playlist. In the screen that appears, click the “Add” button to browse your computer for an ogg or mp3 file to add to your playlist. To delete a song from the list, select it then click the “Remove” button. You can order the songs by seclecting them and clicking the “Move up” or “Move down” buttons. Use the “Play” button to listen to the selected song. Once you have recorded a performance (see recording in the drumming menu), you can listen to it and export it as a wav file. Click the “Recordings” button in the home screen to access these features. Aerodrums saves all the recordings that you make in a folder of its own, using a time stamp to name each file. You can see a list of all recordings that are currently in Aerodrums’ directory. When you select a recording, you can listen to it, rename it or delete it by clicking the corresponding button. After a while, there could be many recordings (ael files) in the “Recordings” folder located in your Aerodrums installation folder. We recommend that you regularly remove superfluous recordings and to make copies of recordings you wish to keep for later. You can export the selected recording to a wav file by clicking the “Export wav…” button. If you check the “Incl. song” tick box, the .wav file will include the song that was playing when you recorded, if any. You can also set drum panning to center and disable reverb. Click the “Latency” button in the home screen to change the latency settings. These radio buttons determine how sensitive Aerodrums is to subtle air drumming gestures (strictly speaking, they don’t pertain to latency). If you are hearing drum hits when you don’t intend them, change this setting from “Expert” to “Proficient”, or from “Proficient” to “Beginner”. Note to Windows 8 users: Windows 8 has some hardware interaction issues between Bluetooth, WiFi and audio, please see the troubleshooting section for more information. This setting determines how many audio frames must elapse after a drum hit is detected until the produced sound can start being rendered. How low you can set this value depends on the performance of your computer and on the quality of your sound card and driver. If you set this value below what your audio hardware can handle, you will hear audio glitches while drumming. We invite you to test decreasing values of this setting until you reach the minimum value yielding glitch free audio. To test your current audio buffer size pick, click the “Apply” button, then the “Test” button. This test is only a guide, you may need to further adjust the audio buffer size if audio glitches occur while drumming. “Exclusive WASAPI” gives the lowest audio latency, but prevents other programs from playing any sounds while Aerodrums is running. This is the setting we recommend. “Shared WASAPI” gives intermediate audio latency, with the advantage that other programs can play sounds while Aerodrums is running. “Windows default” should only be selected if the other settings are greyed out. See the troubleshooting section to understand why that may be the case and how to remedy it. A lower latency option that avoids sampling rate conversion but may restrict other applications from outputting audio. This option will give the best results. A higher latency option that will “play nicely” with other applications. Your choice of a new audio API takes effect when you click the “Apply” button. We recommend that you re-adjust the audio buffer size after changing API (see above). Back to First run section. If your computer is equipped with several audio devices that you use simultaneously in different programs, you can manually select which one you wish Aerodrums to use. To do so, click the “change” button located to the right of the line naming the current audio device. Besides offering some ready made drum kits, Aerodrums lets you compose your own kits, including the customization of drums with your own samples. In the “Drum kits” screen, there is a “New” button under the drum kit list that lets you create new kits. Name the new drum kit (entering a name is necessary to save the new kit, and the name has to be unique). Select whether it is a right or left handed kit. Add drums or cymbals from the list of available elements: select the element you want to add then click the right arrow button (you can also double click on the element). Remove drums or cymbals from the list of chosen elements: select the element you want to remove then click the left arrow button (you can also double click on the element). A drum kit can contain several identical drums or cymbals. To save the new drum kit and return to the kit choosing screen, press the “Ok” button. Instead of composing a new drum kit from scratch, you can use an existing kit as a base: select an existing kit then press the “Clone” button. You can also edit an existing drum kit: select it then click the “Edit” button. You cannot however edit the presets that came with Aerodrums (including adjusting the drums from the drumming menu). You can “Clone” the preset first and make your modifications on that copy. To delete a drum kit, select it then click the “Delete” button. You will be prompted to confirm. When you create new drum kits, the location of new drums or cymbals will be unknown. When you click “Drum” or “Setup” for the first time with a new kit, Aerodrums will ask you to place each new drum one after the other before you can start drumming. This process is similar to the “Place all drums” feature of the drum kit adjustment menu: you place each drum by making an air drumming gesture at the location where you want it. When you are in the drum kit editing screen (reached with the “New”, “Clone” or “Edit” buttons in the “Drum kits” screen), you can add new drums or cymbals by clicking the “New” button at the bottom of the “Available elements” list. Name the new element (entering a name is necessary to save the new element, and the name has to be unique). Browse your computer for a directory containing the sound samples that will be played when that drum or cymbal is hit. Use the radio buttons to select what type of drum kit element you are making. When you press the “Ok” button, Aerodrums will analyze the samples in the directory you provided and package them into an element (.ele) file. The samples will be sorted by increasing loudness (assumed to reflect hit strength), normalized and packed for efficiency. Depending on the number of samples you provide, this process may take some time. A progress bar will be displayed and you will be able to cancel the operation. For all element types except Kick, Hi-hat, Hi-hat Splash, Custom (pedal) and Custom (pedal & sticks), you can place the samples directly in the directory. You can also place the dominant hand samples in a sub-directory named “r”, and the non-dominant hand samples in a “l” directory. Aerodrums supports distinguishing between dominant and non-dominant hand hits. For the Kick, Hi-hat Splash and Custom (pedal) elements, you can place the samples directly in the directory. Alternatively, if you have two sets of samples corresponding to the same pedal, you can place these in sub-directories named “a” and “b” and Aerodrums will alternate between them. We recommend that you re-use the box that Aerodrums came in to store or transport it. This will ensure that the tips of the drum sticks do not touch other surfaces. They are made of a fragile material and contact with other objects should be minimized.